Photo booth stories are part of a lot of people's pasts. 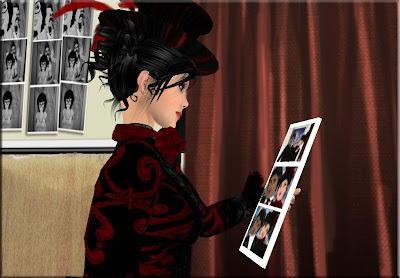 Photo booth memories are what most people recall of their past already gone but not forgotten. There is that kind of charm that these wonderful gadgets have in them. It might be because of what they can do. Photo booths can make out instant keepsakes in the form of personal photos. They can capture a moment in time on snapshots that can, time and again, bring back those memories just with a single glance. And the photos make for great keepsakes too. People just can't help but have their photos taken in photo booths. That is its allure. The emotions a photo booth evokes is what possessed me to put one on La Musique so everyone can enjoy it. And it's absolutely FREE! Richard Brink was kind enough to help me test out the photo booth. The pictures you see to the left are pictures actually taken in the photo booth! Neat, huh? It has a ton of poses and backgrounds to choose from. So I bet you are wondering . . . There is not much to it, you sit in the booth and it gives you instructions on how to change the poses and backgrounds. No, you have to click snapshot and upload it. What do I do with the filmstrip? You can put pictures inside the film strip, just drop the textures in the squares. Can you fit more then two people in there? There are only two seats, but you can squeeze a few people in. They can stand in the back or sit on a prim and slide themselves in. Come to La Musique and create new memories!